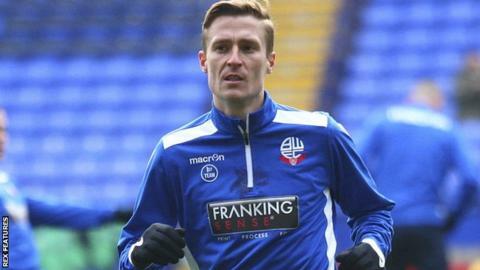 Bolton defender Stephen Darby has announced his retirement from football, aged 29, after being diagnosed with motor neurone disease (MND). The full-back last played in December. "I would like to ask for privacy at this time so I can adjust to the battle I have ahead and that I can spend time with those closest to me," he said. Darby, married to Manchester City Women and England captain Steph Houghton, began his career at Liverpool after coming through the club's academy. "I'd like to take the opportunity to thank my team-mates, manager and all the staff at Bolton for their amazing support at what has been an extremely difficult period," he said. MND is a degenerative condition that affects how nerves in the brain and spinal cord function. There is currently no cure. After leaving Liverpool, right-back Darby made more than 200 appearances for Bradford City before joining Bolton in July 2017, reuniting with manager Phil Parkinson. "This is heartbreaking news for Stephen and his family and the thoughts of everybody at Bolton are very much with him and Steph," Parkinson said. A former England Under-19 international, Darby made his senior Liverpool debut against Atletico Madrid in the Champions League in 2008, before loan spells with Swindon Town, Notts County and Rochdale. He joined Bradford in July 2012 and would eventually captain the Bantams during a five-year spell that included a giant-killing run to the League Cup final and promotion to League One in 2013. "The news is absolutely heartbreaking," Bradford chairman Edin Rahic said. "Stephen was a massive part of the club's recent history and his contributions will stay with us forever." Darby was also Professional Footballers' Association club delegate while at Bradford and an active member of their management committee. "Stephen has been the epitome of a true professional," PFA director of player management Matthew Buck said. "I'm sure he will face the future with the same determination and resolve he has shown throughout his football career. Myself and the PFA will continue to support Stephen in his battle ahead."